The Working Musician | "Rock 'n' Roll, I gave you all the best years of my life". Experiences, musings and reflections from a professional musician in Perth, Western Australia. "Rock 'n' Roll, I gave you all the best years of my life". Experiences, musings and reflections from a professional musician in Perth, Western Australia. Bands I have played in. Let’s face it: 29 years of playing music is a long time. Over the years I have played in many bands. In this post I’ll list them all, and expand my thoughts on each as I recollect. I’ll only add bands that I was in for a genuine period of time or had significant input into and for the moment I’ll leave out any bands that I filled in for or helped out on occasion. Enjoy! My new Van Halen tribute band. First gig was June 9 and was potentially a one-off, but it was a very successful and fun show, so we’re keeping at it! One of my original bands, this one plays my solo work. New EP due out in spring. This band plays material from my albums ‘Big Appetite’ and ‘Little Empires’. Previous members include: Mat Ferguson (drums / percussion), Joe Southwell (bass), Selena Meegan (violin / percussion in recording sessions and at first gig), Dan Hart (tenor sax in recording sessions and at first gig), Dan Toal (keys / bass in recording sessions, plus acoustic guitar at first gig). My Def Leppard tribute band. Surprisingly not as in-demand as I’d hoped, given that the band developed the sound to a high quality. The gigs we have done have been well-received. A retro-metal band that I found myself in after re-connecting with my old friend Nic Di Rosso. One EP was released in 2013, another was recorded but (as yet) not completed. My original band project with Mat Ferguson and Joe Southwell, previously Gareth Hughes. This one started life as Chris Gibbs Trio. WAM Song of the Year Country category winner in 2013. Full-length album was released in 2012, single in 2016, two more singles to come in 2016 followed by the complete EP. Previous members include: Gareth Hughes (bass), Dan Toal (keys). A Whitesnake tribute band formed by Gareth Hughes. The band features members of GFH and Ragdoll amongst others, and gigs occasionally. The original line-up (and the majority of gigs) included Gareth Hughes (bass) and Mat Ferguson (drums). My rock covers band, power trio format. Previously known as Chris Gibbs Trio and Living Large, with many line-up and format changes over the years. We play everywhere! Bassists have included Gareth Hughes, Joe Southwell, Dan Toal, Craig Skelton and fill-ins from James Vincuillo, Luke Reynolds, Dave Fontana and Scott Kay. Drummers have included Mat Ferguson, Elliot Smith, Sam Pettit, Greg Brenton, Warren Daley, Wayne Antioch, Joe Southwell (yes on drums!) and Dan Toal (yes again on drums!). Vocalists in the extended line-ups have included Karin Page, Casey Craig and Pete Knott. Dave Hughes was the vocalist/percussionist in the reduced duo line-up. My wife Jen played keys in an extended line-up for around ten gigs too! An instrumental band which I formed to play some compositions I wrote for my second year Songwriting class at WAAPA. All of the members were WAAPA classmates. We only played a handful of gigs and they were really fun. The material was instrumental rock in the style of Joe Satriani. We also used to play ‘And The Address’ from Deep Purple’s first album. Good times. I’ve promised myself to record this band / these songs one day. Another crucial WAAPA ensemble in terms of networking. Joe and I have played in CHRIS GIBBS BAND, GRAPHIC FICTION HEROES, CHRIS GIBBS AND THE TRANSMISSION and EZEREVE together as well as collaborating on recording projects. Andrew played in FASHION WITH A GUN and filled in occasionally with CHRIS GIBBS BAND. A cover band I formed to pick up extra work when my other group AUDIOPERV went on holidays. The band continued after I left in 2009, holding the coveted Saturday night residency at The Shed (now Skye Bar) until very recently. I studied at WAAPA as a mature-aged student. This ensemble was crucial as it would introduce me to a number of musicians that I would go on to collaborate with on many projects. Gareth and I ended up playing in GRAPHIC FICTION HEROES, CHRIS GIBBS BAND, SNAKEBITE, CLAIRE CLARKE, EZEREVE and WHISPERING JACK together. Elliot has played numerous gigs with CHRIS GIBBS BAND and we have collaborated on recording projects as well as both now having teaching positions at WAAPA. Matt and I played together in FASHION WITH A GUN and we have collaborated on recording projects as well as Matt handling the Advanced Diploma student recording projects for WAAPA. This ensemble (and the course in general) was crucial in expanding my network of musicians for future projects. OK so in 2005 my gig with KISSTAKE was a one-off, but it started an association with the band. I joined permanently in 2008. Yes, it’s a KISS tribute band, I’m the Spaceman! Another band with many line-ups, I’ll consult with Bob Gordon before posting the family tree! One of Perth’s most successful 2000s cover bands. I joined after the band had been working for a couple of years, the group disbanded in 2007. Reunion gig scheduled for December 2016! One of my most successful original bands. Kingpin featured members of F.U.L.L. and STONEFACE. The band briefly toured the UK and all over our home state, supporting some of the biggest bands of the time. KINGPIN released two full-length albums, three if you count the remix of the second album. A third album was released as singles over twelve months but was never compiled into one release. The band never officially split, the 2006 date represents the last time on stage: 25th April 2006 supporting NICKELBACK at Burswood Dome! Previous members include: Vito DeFrancesco (rhythm guitar / keys) and Glenn Wallace (touring bass). The band I played in for most of the 90s. Critically acclaimed at local level, a couple of brief interstate jaunts, constant local and regional gigging including several high-profile support slots, a WAM Song of the Year award (1998), and a couple of WAMI awards (1997). F.U.L.L. released three EPs and a full-length album. Previous members include: Jarrod Ward (drums) and Glenn Hewitt (a few gigs on drums while we were seeking a replacement for Jarrod). My first fully-original band. The band released a cassette(!!!) entitled ‘Soul Disorder’. I enjoyed a lot of the music in this band. Unfortunately the grunge onslaught of the early 90s left the members a bit confused in terms of direction and F.U.L.L. was born after the rhythm guitarist / co-vocalist Nick Wellstead left. My first genuine working band! JOKER played AC/DC, THE ANGELS, STATUS QUO and more as well as a couple of originals mostly written prior to my joining. Vocalist Wayne Curnow now sings with very-popular AC/DC tribute act HELL’S BELLS. My first band, formed in high school. Originally we were called JAGGED. I still have the PARTNERS IN CRIME banner / backdrop! The band only played a few public shows, mostly in halls. Several members of this band would end up playing with me in future acts. There were a number of variations: Jarrod Ward was our only drummer, bassists over the years included Mark Humphries and Steve Gibbs (Owen Trainor and Peter Iucalano also did some school gigs), guitarists over the years included Jules Weeks and Nic Di Rosso (Nic also sang), Jamie Regan was the vocalist and later a guitarist (and even pretended to play guitar, but that’s another story! ), Toby Wilson played sax at the school gigs. I played guitar and sang a few songs. Graphic Fiction Heroes is a band that I sing and play guitar in. The original line-up of the band included Gareth Hughes on bass and Mat Ferguson on drums. In 2012, Gareth moved to the UK and was replaced by Joe Southwell, and for a brief period in 2013-14 Dan Toal was in the line-up on keys. Today I was thinking about the first GFH album, ‘Who Will Save Us Now?’ and I decided to put some of my reminiscing into print. In 2008, Gareth and Mat joined me in an early version of Chris Gibbs Band (my current rock covers bar band) and we performed many gigs all over the state as both Living Large and Chris Gibbs Trio. In December 2008 I commenced demos for what was to become my first solo album, ‘Little Empires’. Early in 2009 I invited Gareth and Mat to play on the album. Mat recorded his drum parts at Soundbaker with Rob Agostini, and some additional parts at my home studio, while Gareth recorded everything at my home studio. It was the first album that I tracked almost entirely at home, but the final mix was handled by Rob. Upon release of the album we continued to work as both the cover band and the original band, and scored some good gigs along the way. However I felt that a natural progression for the line-up would be to invite the guys to write with me for a follow-up record, under a band name rather than my name, and Graphic Fiction Heroes was born. Incidentally the GFH in the name comes from Gibbs, Ferguson, and Hughes as a starting point, suggested by my good friend and agent Frank Gugliotta. TOO HIGHLY STRUNG – Chris (not a co-write) I recall that I demonstrated the melody idea for the chorus to the guys at the end of one session, but we never worked on the song. In the end, I recall writing the melody and lyrics in my classroom at ABMUSIC where I was lecturing at the time in breaks between classes, and that the lyrics changed several times before they eventually became thematically relevant to the band name and album title, contributing to the notion that at one point this collection of songs was shaping up as a concept album. Although there is a common thread, with several songs referring to experiences in the music or entertainment industries, and a thematic thread with songs referring to superheroes and the like, a concept album was eventually decided against in favour of an overall concise feel to the material. FIRST AND LAST – Chris (co-write) This one as I recall came pretty easily, as I already had all of the sections written, except for the second verse which the guys contributed to, and it was Gareth who came up with the excellent idea of extending the last line of the final chorus to be be ‘first, second, third, fourth, fifth, sixth, seventh and last’ which I love. This song would go on to win the Country category of the 2013 WAM Song Of The Year. WHO WILL SAVE US NOW? – Interesting one: Mat had the verse riff and feel, Gareth had the chorus and release riffs. This was the first one we worked on as a team, I suggested they put the riffs together as they were already in the same key centre and then we started on melody and lyrics. It’s the only co-write on the album that didn’t come in with a melody and some lyrics already attached, and became the centrepiece for the recording. Gareth had a lot to do with the phrasing and rhythm of the melody, especially in the verse and release sections. JUST ONE THING – Chris (co-write) Another one of mine that was pretty much there, ably shaped by the guys into something special. WHEN IN ROME – Mat (co-write) I have fond memories of the first time Mat played me this song. We were in our spartan accomodation on Rottnest Island where we were playing a two-day stretch of gigs. Mat grabbed my guitar, tuned it to drop-D, sat on the bunk bed and sang me the first verse, release and chorus. It reminded me of everything I ever loved about The Police, and lyrically it felt legitimate, as Mat had recently travelled to Europe with his wife Claire. The song is essentially an excellent use of metaphor, treating the popular sights of Rome and its structures as the foundation of their lives together. I loved the song. When we worked on this one we did a lot of shaping and re-working to ensure that metaphor was really strong and prevalent, and we tightened up the rhyming patterns and phrasing, but pretty much every line Mat wrote is in the final version in some form. I recall that we were very much into researching on the spot when writing together, often pulling up resources online for inspiration; in this case it was the addition of the Anatheum (which had recently been excavated in Rome) which is one of the only locations not present in Mat’s original lyrics. MISSING YOU – Chris (co-write) True to my form in these sessions, this one was quite developed. The lyrics were shaped, and again Gareth came up with the excellent modulation for the guitar solo section. ANOTHER DAY LIKE THIS – Chris (not a co-write) This song was supposed to be on the ‘Little Empires’ album but I decided to leave it. The song was written for a previous band of mine, Kingpin, back in 2003. It was used for a recording assignment when I was studying at WAAPA in 2007, and I’m glad it finally found a place on a recording in 2012. In the first version of the lyric, the make-up could refer to anything or anyone, as with the pretending. In the final version, the use of ‘greasepaint’ and ‘make believe’ strongly suggests acting, which of course is what the song is about: an actor struggling with identity. And so with some re-shaping of that first line, the stage is set, if you’ll forgive the pun! This use of imagery in any case started to show up in early drafts of Mat’s more recent writing, that art of saying more with less. That’s what led us on our research during that session. I Recall that a lot of the clever references to music structure in the chorus were put forward by Gareth. This one was a labour of love for all of us and the only song which had a major melodic overhaul in our sessions. It can be very exposing for an individual to present a song for co-writing, and Mat was really close to the material in the original version of the song. I recall that things got a little heated when I put forward the notion that the song wasn’t really melodically up to the standard of the other work, but after a few stumbles we found common ground, re-working the entire melody and chord change, but retaining the spirit and majority of the lyrics, tightened and re-shaped into what would become one the best songs on the album. Once we got moving on this one, it was a testament to what can be achieved if objectivity prevails: Gareth re-shaped the chords that I suggested into something more unique, Mat worked hard to adapt his lyrics to the new melodies, and I relished the opportunity to turn some genuinely engaging lyrical concepts into a complete work while still maintaining the intent of the original lines. It was this session that taught us all a lot about effective collaboration, and the proof is in the pudding; it’s a solid song. Quote of the session definitely goes to Gareth though, who remained very quite while Mat and I were getting passionate. When I finally appealed to Gareth for support, asking him whether he thought the song was acceptable in its original form, he calmly replied “I think it needs some work…”. Mat and I were travelling back from a duo gig one night and we had a conversation about the blues, specifically blues artists and which ones came across as ‘the real deal’. I remember saying how funny it would be if there was a blues artist who always talked about the common blues cliches as having NEVER done them, which we both found quite funny. The interesting thing about the project is that not many people realise how much initial material for the album was generated by Mat, who was contributing as a genuine songwriter for the first time in his career. I had heard his work in some of his previous bands such as Vellocet Drive and Zenburger, but he had contributed comparatively little in terms of writing in those earlier bands. He had come down and performed some newer material on vocals and guitar at a few open mic nights I was running, so I had an overall picture of where he was at, but his output of work for the GFH album in no doubt shaped the band’s sound and approach in a meaningful way. Just as importantly, although Gareth didn’t bring as many raw ideas to the table, his work on melodies, phrasing, rhyme patterns and chordal arrangements lifted every song we worked on, again contributing to the band’s sound and approach. It’s excellent to reflect upon these sessions. I hadn’t co-written a song with anyone since 2005 so it was a steep learning curve of me to re-learn how to relate to and interpret other writers’ concepts and ideas. I know that I have been able to collaborate much more effectively since this project. Mat went through a baptism of fire and lifted his skills to a new level of writing which is evident in his recent work, but even in their rawest form the songs and concepts he brought to the table lent a personality to the album that could not have been generated had I been the sole writer. Gareth was the epitome of calm throughout, with genuinely insightful ideas throughout the whole process, more often than not providing the missing piece required to move forward in a session. Well done guys, it was both rewarding and fun. And we always had dinner afterwards! Here’s a review I wrote for X-Press Magazine on the Fender American Special Stratocaster. Not long after this was published I bought one and I haven’t looked back! The price listed in this article was last year and in AUD, since then the Australian price has jumped back up to around $2299. Akin to the early 2000’s ‘Highway One’ series of Fender guitars, the American Special series aims to put genuine U.S-made Fender quality into the hands of players at a reasonably affordable price. The American Special Stratocaster is great-looking guitar that will particularly appeal to fans of 1970’s Stratocasters, largely due to the similarly designed large headstock. Featuring a lightweight alder body with gloss urethane finish which is available in three colours – red, surf green, and sunburst – these guitars certainly look the part. A maple neck with 9.5-inch radius fingerboard and 22 jumbo frets provide the feel that only a Fender guitar can deliver. From blues to country, funk to soul, and even rock to metal, there aren’t many genres of music that the Stratocaster has not driven at one point or another, and a genuine Fender Stratocaster seems to eventually find its way into every guitarist’s collection. Indeed there have been many copies and models or brands ‘inspired by’ the Stratocaster (some of which come very close to the mark), but there simply is no substitute for the real deal. Single coil Custom Shop Texas Special single coil pickups in all three positions provide the powerful Texas tone, while a vintage-style synchronized tremolo finishes off what is essentially an impressive throwback to simpler times with better tones. At a retail of around $1699, the Fender American Special Stratocaster is hard to put down. The Fender American Special Stratocaster was reviewed at The Rock Inn, Mt. Lawley. A blog post from my wife Jen. Great writer! I have been with my husband for five and a half years. We met in mid 2006. He was the guitarist in a band and I was freshly single after a humiliating break up. We were friends for two and half years, and housemates for one of those years, before we got together at the end of 2008. We married on our 3rd anniversary in 2011. The entire time I’ve known Chris he has been a professional musician. And by that I mean a musician who earns his living from music. I knew that when we got together it would be different to dating a nine to fiver, and it is still very different. There a pros and cons. But mostly pros. Sometimes I write music articles and product reviews for X-Press Magazine. Occasionally I’ll post an article right here. This was a review I wrote a while back on Graham Greene’s guitar clinic at Classic Sounds. Graham has always been an inspiration to me and I hope to see him perform on the circuit in 2016. Classic Sounds in Kelmscott played host to an evening equal parts educational and entertaining in presenting the Graham Greene Guitar Clinic on Wednesday July 15. In association with WA-based Ormsby Guitars and Mesa Boogie Amplification, the home-grown guitar legend took to the stage for an up close and personal look at his electrifying musicianship, the equipment used to shape his tones and his lifelong journey as a working musician. Over the course of two hours, Greene gave entertaining insights into his enduring music career, from his innocent beginnings on the ukulele in the Kimberley, through to lessons with legendary WA guitarist Cliff Lynton, high-grossing cover bands, tour support slots and encounters with rock stars. Interwoven into the open and honest narrative were performances of several Graham Greene classics, both from his latest album and previous works, the highlights of which were a blistering version of the award winning Impressive Hair from ‘Leap of Face’ and ‘Chicken Soup for the Soul’ from Down Devil’s Road. The latter track in particular showcased Greene’s refined maturity as a guitarist, switching seamlessly between clean, traditional blues licks and inventive overdriven flourishes. A long time endorsee of Ormsby guitars, Greene recounted his early dealings with luthier Perry Ormsby, from when the latter volunteered to serve as guitar tech on some Ice Tiger reunion shows in 2004, through to test-driving some early guitar builds and the eventual official endorsement of a West Australian guitar brand that continues to grow in popularity both at home and abroad. Greene’s GG-6 and GG-7 signature models were heavily utilised throughout the song performances. In addition to these models, the fixed-bridge guitar played on the aforementioned Chicken Soup for the Soul was a standout in its rich and balanced tone. Not utilised as part of the performance but on display nonetheless was one of Ormsby’s multiscale guitars. Greene made specific mention of the philosophy and design behind these unique instruments that feature a fretboard with frets than fan out across the neck at angles that benefit the overall tonality, rather than more traditional vertical frets. Keen to impart his knowledge of the instrument, Greene took the time during the clinic to outline and demonstrate some of his trademark stylistic components, including two-handed tapping, whammy dives, natural and artificial harmonics, and arpeggios. At one point in the clinic, Greene made reference to the importance of the journey itself over the destination, and hinted at the possibility of hands-on guitar workshops in the near future as well as a return to local stages. 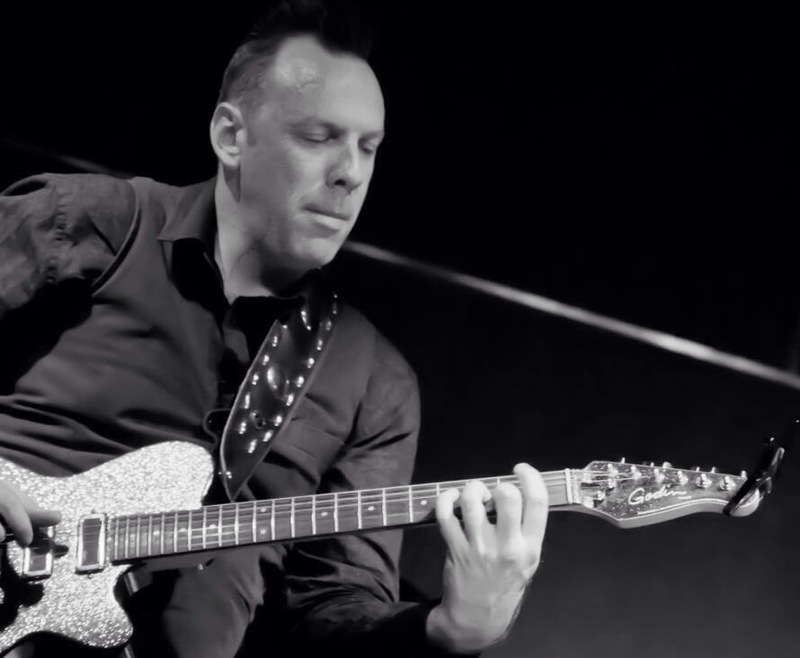 In a career spanning over three decades thus far, it would appear that the guitarist has plans to continue to contribute to the WA music industry that he has had a big part in shaping. This is great news not only for Greene’s existing colleagues and fans, but also for new musicians entering the industry in need of talented, experienced role models. Visit http://www.grahamgreene.com.au for more information on forthcoming performances and recordings. Visit http://www.ormsbyguitars.com for information on Perry Ormsby’s guitars, services and guitar-making courses. This year I thought it would be cool to keep a record of all the albums I listen to from January 1st through to December 31st. I’ll keep updating this post as I listen to more music. I will also list the format in which the album was listened to: vinyl, CD, cassette, digital, or stream. I can only list an album once it has been listened to in its entirety, no skipping, no shuffling. I can only list full-length albums or EPs, no singles. I can only list an album once, repeat listens can’t be listed. Here we go! Feel free to post your listening in the comments. Have a listen to my music! My wife Jen on my music…thanks Jen. I’ve been thinking about this a lot lately, and I really want my husband to hear this. Recently, we were sitting on the couch watching Mr holland’s Opus, one of our favourite movies. It occurred to me on our most recent viewing of this movie, that art really does imitate life sometimes. (And no babe, it’s not just Forgetting Sarah Marshall). You have worked your whole life for a goal you don’t feel you’ve achieved yet. You are talented, you have worked hard at it, you have produced album after album of quality songwriting and inspired music. The only difference between you and any Grammy winning superstar is recognition. The world doesn’t recognise you for what you’ve done, for the hours you put in, for your passion and talent, for that one song that changed a generation, or the anthem the kids can’t stop singing. 27 years in the game. This year on June 8th I will celebrate both my 42nd birthday and 27 years playing the guitar. So that makes 26 years of gigging and 22 years of recording too. I make my living by performing at around 200 shows per year as well as lecturing in various music units at WAAPA (West Australian Academy of Performing Arts). For those of you outside of Australia, that’s the academy that people such as Hugh Jackman and Tim Minchin studied at, so that’s pretty cool! There’s also some amazing musicians who have graduated from WAAPA including Andy Fisenden, a popular drummer and Dane Alderson, a popular bassist. I have been lecturing at WAAPA for three years. Prior to that I built up my lecturing experience at CIT in Leederville and ABMUSIC in Karawara. But back to the music. Aside from thousands of gigs ranging from solo acoustic shows through to masquerading as the Space Ace in a KISS tribute band (more on that later), I have now recorded and released…let me see…12 albums or EPs in various projects. That’s one with Prey Foreign (pronounced ‘pray for rain’, yep, I know, and a CASSETTE no less! ), four with my nineties band F.U.L.L. (three EPs and a full-length album), three with my 2000s band Kingpin (all albums), one with Axe Cane, a metal band I was in a couple of years ago (an EP), one with my current band Graphic Fiction Heroes (an album), and two solo albums. There’s also an unreleased Kingpin album from 2005, an unfinished Axe Cane EP, and a new Graphic Fiction Heroes EP that is currently in the works. Looking back on it, that’s a lot of product with so many memories, mostly good, some not so good! I’ll utilise this blog to talk about each act and era of my career, touching on what I did right, what I did wrong, and how it all has helped to shape me as a person and a musician over the last quarter century (!!!) and change. As we go along, I’ll talk about some other work I’ve done here and there too while I have been chasing my dreams. There’s my job at Commonwealth Development Bank when I graduated from high school (the only non-music industry job I have ever had), my guitar teaching business (Full On Guitar Tuition), my management position at Joondalup Music Centre (a music retail store in Perth’s northern suburbs), my freelance writing (mainly with X-Press magazine) and my radio announcing (volunteer based with 89.7 FM). I’ll also weigh in with my thoughts on building a music career whilst maintaining a relationship. I am currently married to my second wife Jen. We have a baby boy, Wiley. I also have a son from my first marriage, Brody. He’s 11. Like anyone who runs their own business, my music career has been frustrating, challenging, rewarding, tiring, energising, unprofitable, lucrative, productive, counter-productive…you name it, and sometimes all in the same day. For now, welcome! I hope that my future posts provide an insight into my life as an independent musician ‘in the trenches’ and a good laugh here and there. Here’s a shot from the December 2012 Graphic Fiction Heroes ‘Who Will Save Us now?’ album launch at Paddington Alehouse. Pic by Bree Ferguson Photography. Joe Mahon on Bands I have played in. wileysmum on 27 years in the game.